All Aboot Building Web Applications in the US of Eh! We have finished converting another site called Adventarian. It’s a travel website/blog. It is a little outdated with the content, but it still needs to move over to .Net. I have to say that I really enjoyed reading the content and all of his adventures. I personally enjoyed some of his photos from living in Canada. 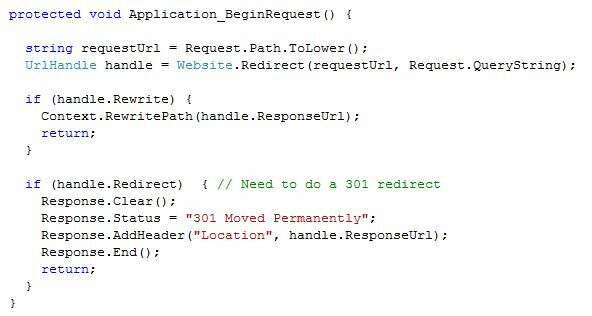 Technically, we used URL rewriting for updating the old parameter method of ASP to more SEO friendly URL structure. Take a look at the code below. Easy. Speaking of content, we had another client that did all their home work in record time. A new site for Ace Moving is up and running. Kept the look simple since the plan is to use this as a landing page from their Yellow Book ad (it’s the nature of the Winnipeg moving market, so don’t judge). I have to be honest here, the number one issue I have with clients is getting them to write their content or at least supervise their content. Here is the issue: They are the expert in the subject domain. My team is not. My team knows how to program, rank, image manipulation, and design. They do not know the ins and outs of selling media sign on the sides of trucks that roam downtown Saturday night. Nor do they know the fine art of selling used books and VHS tapes. We do have writers available to actually do the writing, but they too know little of my client’s domain and need direction. Too often we hear “just write something, and I will approve it”. They don’t and some even get cross at how wrong we were. [sigh]. Garbage in, garbage out. Anyway, I was very surprised with our new clients at Allergy Free Info wrote their own beautiful content, but they also provided their own links and citations! Citations! It brought a tear to my eye, because that is what the initial dream of the web was. Centers of knowledge universities building upon each other! Every site should have a site map. A site map is just an xml file that lists all the unique pages that you want to be index. You are literally telling the search engines “Hey, these are the pages that I think are the most important”. It should sit in the root of the web site and should be called “sitemap.xml”. You can call it anything you want, but it seems to be an industry standard. I know WordPress.com uses the “sitemap.xml” convention. For sites that are less then 500 pages, you can use the free online Sitemap Generator at XML-Sitemaps.com For sites with more then 500 page, you can use Xenu by Tilman Hausherr. This piece of magical software will create your site maps, but it does so much more. I will talk about its extended abilities some other time, but for now, once you get your sitemap in the root directory, you need to tell Google and Bing explicitly where to find it. 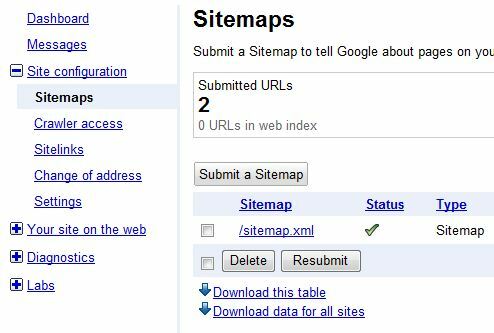 In both webmaster tools there is a place to submit a sitemap. Below is Google’s place. Each of these tools requires that you have control of the site. You are currently browsing the archives for the Site Setup category.